DEAR JERRY: No sooner did I finish reading about some lengthy song titles in one of your recent columns, when that very night on American Idol, Steven Tyler rattled off a dandy — that is if it really is a legit title. It may have been a bunch of made-up nonsense, of the frim fram, ossenfay, chifafra variety. Though I don't recall any of his gibberish, it came up when they were talking about Nat King Cole recordings. Was it hogwash or the real deal? DEAR MAURICE: I'd say it is a little of each. That Aerosmith's front man even knew this obscure tune — not having been a hit by anyone — is surprising, but his ability to flawlessly cite its main verse is downright amazing. Apparently his mother played Nat King Cole often and Steven grew up listening to him. He never forgot those songs he and mom once enjoyed. Two weekes later, Casey was unfortunately sent packing. Not to worry, with Casey's many talents his future success is a certainty. The writers of “Kemo Kimo,” Moe Jaffe and Dwight B. Latham, were no strangers to clever and zany lyrics. Their most famous tune is the novelty “I'm My Own Grandpa,” a Top 5 for Lonzo & Oscar in 1948. “Kemo Kimo” was recorded and first came out in 1947, the year before Steven's birth. It is the lead track on a three-disc 78 rpm album, “King Cole for Kids (Songs for Children By the King Cole Trio)” (Capitol DC-89). In 1951, Capitol added two more tracks and reissued the kids collection as an eight-track, 10-inch LP (H-3070). “King Cole for Kids” was the second Capitol 78 album for Cole, but not until his third (“Penthouse Serenade”) did they begin including “Nat” in his cover credits. DEAR JERRY: Like most teenagers in the 1960s, I was in tune with the Top 40. But unlike my R&R peers, I also listened regularly to a weekly radio program called Showtime, that featured soundtrack selections. I don't recall the host, but it ran on a San Francisco station, though it might have been syndicated. Whether it's from a “Clown” movie or not, I don't know. My research has turned up nothing. Can you help? —Lee Andersson, Daly City, Calif.
DEAR LEE: Fortunately neither of us is beset by coulrophobia, or we'd be forced to scrap this little adventure. Real-life husband and wife, Jack Cassidy and Shirley Jones, play the fictional Irish couple, Phineas and Maggie Flynn, as they face the challenge to survive in mid-19th century New York. Cassidy is the lead voice on “Mr. Clown,” but is joined by lovely Maggie (“picture a map of Ireland on a freckled face” and “a leprechaun dressed up in Irish lace”), plus a childrens' chorus. 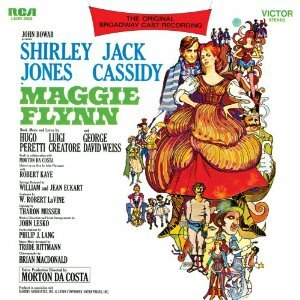 Now that you know what you're looking for, “Maggie Flynn (The Original Broadway Cast Recording)” (RCA LSOD-2009) can usually be found online in either the LP or CD format. Both have the exact same selections. IZ ZAT SO? By Broadway standards, the 82 performances of “Maggie Flynn” (October 23, 1968 - January 5, 1969) is barely a blip on the Great White Way radar. Longevity champ “The Phantom of the Opera” is closing in on 9,700 (January 26, 1988 - present)! Maggie's music, however, lives on. The Original Cast Recording often turns up on those All-Time Best of Broadway lists. Moreover, “Maggie Flynn” has taken up permanent residence among my Top 10 cast albums. It isn't uncommon to see the everyday items of our past make it into the mainstream again, especially with young people. Clearly leisure suits, 8-Tracks, and gas guzzling land yachts never seemed to make it with the youth of today. Yet we are in the middle of the largest format revolution since the advent of the compact disc; except this time, young people all over the world are picking up a once forgotten format: vinyl records. All throughout the United States, teens and young adults alike are doling out cash for vinyl re-issues of their favorite records, or even better, getting the latest artists and records on vinyl. In the age of digital downloads, mp3’s and compact discs, youth in America are embracing the analog experience in the biggest way since the 1970s. The exact cause of this “digital devolution” is not entirely known. Is it that young people are becoming intrigued by the physical experience vinyl gives to the user? Or perhaps they are noticing a difference in the sound reproduction? Is this some fad or is it here to stay? No one knows just yet what the state of vinyl is now and what it holds in the hearts of millions across the country, but we do know that the vinyl experience is different for everyone who is involved. It’s time to find out exactly what is behind the black wax revolution. Photographer Ben Meadors and writer Owen McCafferty are going to set out on a journey to discover what exactly is inspiring people all over the United States to buy vinyl, and share that journey with all of you. By raising $6,500 Ben and Owen will travel to Portland, San Francisco, Chicago, Cleveland, and New York City, to photograph and interview young record collectors, record store owners, and the occasional vinyl buyer to ask them why they love records, and what keeps them buying. After collecting the pictures, Owen will write a narrative to document their journey in a 180+ page, full color photo book to share with the world. Your donations will contribute to the traveling expenses in each city, as well as help to print a small quantity of the books. Those who donate $165.00 or higher will receive a signed copy of the beautiful book autographed by both Ben and Owen. The initial copies will be specifically made and commissioned for donors. A few extra copies will be printed in hopes of having the book sponsored by a publishing company in order to have it distributed on a large scale in book stores throughout the world. With enough funding, this project will bring the vinyl revival to the forefront, and give everyone a glimpse into this new culture that is taking precedence in the lives of music lovers everywhere. Your contributions will not go unnoticed no matter what size it may be. Stop By kickstarter.com and support the project!